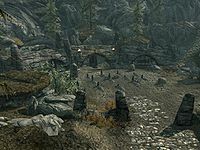 Hamvir's Rest is a small graveyard to the northwest of Whiterun, right next to Dustman's Cairn. There are three skeletons patrolling the area and a draugr sleeping in the upright sarcophagus. There is a master-locked chest beside the sarcophagus and a random enchanted helmet behind the grates to its left. A total of eight nightshade plants can be found spread throughout the tombstones. Additionally, there are two purple mountain flowers and two lavender plants. This is the final destination of the Headless Horseman on his nightly travels; once he reaches this area, he will disappear regardless of the time of day. There is an iron ore vein west-southwest of the ruin.